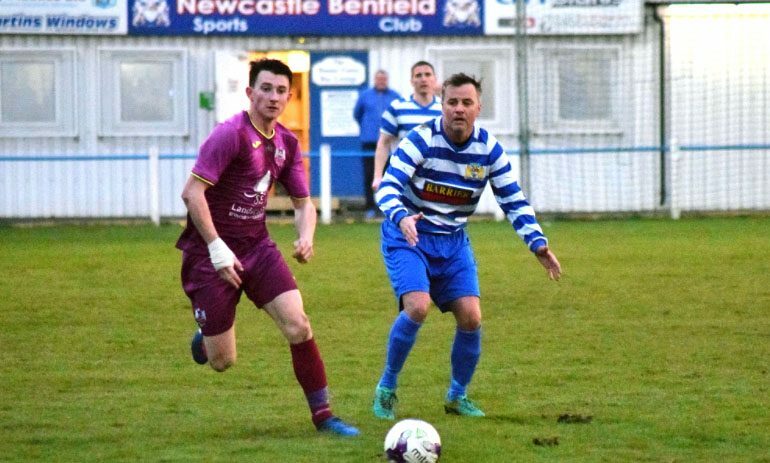 Newton Aycliffe came away from Newcastle Benfield wondering how they lost 1-0 on Monday night. They dominated much of the play, but had no luck and appeared to be robbed of a good goal right at the end. Benfield went into the game in fine form, but were insipid on the night, as Aycliffe’s all-round performance frustrated the home side. Aycliffe started brightly and centre forward Craig Hutchinson finished off a fine team move by getting his shot away, but it was straight at home keeper Grainger. Another good move ended when Benfield conceded a free kick, but Thibault Charmey put his shot over the bar. Benfield finally got into the game on 12 minutes when Devlin got a shot away, but the angle was too tight and he hit the side netting. Aycliffe looked comfortable and the normally free-flowing Benfield were restricted to trying long balls over the top and trying long range shots. They put three such shots well over the bar, as the half progressed. Aycliffe were playing the better football, with Marc Costello dominating the midfield. They had several shots blocked, and Ben Trotter had a good shout for a penalty turned down, with the half finishing goalless. Benfield made a tactical change at half-time, deciding to man-mark Aycliffe man-of-the match Costello in order to reduce his influence. However, on 54 minutes he hit a screamer that hit the bar, with Grainger beaten. Benfield responded and on 58 minutes a free kick from the left touchline evaded the Aycliffe defenders and Turnbull got a touch to put Benfield ahead against the run of play. Aycliffe came back and Matthews was unlucky when his shot beat Grainger but went past the far post. Another good move finished with substitute Nathan Stephenson hitting the target, but Grainger made a fine save. Benfield took off centre forward Brayson and replaced him with a defender, as they looked to defend their slender lead. One minute into injury-time, an Aycliffe free kick was played into the box, and centre half Andrew Grant-Soulsby headed the ball in, only for the officials to give offside against another player, who wasn’t involved in active play. Aycliffe were left to rue their luck, as Benfield held out for the win. Aycliffe, now 15th in the Northern League first division with six games of the 2017-18 season left, are due to play Sunderland RCA at home on Saturday (April 14, 3pm).